Cold room above garage and cold floor in kitchen (no basement below). I would love an estimate on insulating my attic. We have electric heat and need to keep the heat inside! Interested in Sprayfoam insulation for our attic. Every year, families lose money on their energy bills because their house leaks out energy. This can cause your home to be too hot or too cold, making for a very uncomfortable living environment. The biggest culprit for energy loss is the attic area because it is often inadequately insulated. This can be resolved with our SuperAttic insulation system and SilverGlo rigid foam insulation which are proven to cut down on energy costs by keeping your home properly insulated. There are different benefits for both spray foam and rigid insulation. Spray foam is quicker to install and expands to fill in gaps, though it can be a bit messy. Rigid insulation, like the SilverGlo insulation, is usually better for basements and crawl spaces because it is less messy and has a variety of sizes, but is not as well-suited for attics because it can have an R-value as low as R-3.8 per in. and is more time-consuming to install. During the winter months, homeowners sometimes experience discomfort because heat is escaping out of their house to try and warm the cold outside. This is due to poor insulation and air-sealing. 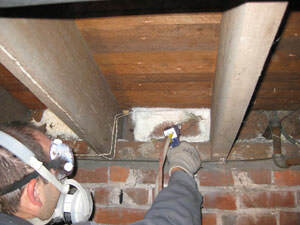 Often, poor air-sealing is apparent most in crawl spaces because of their location in the home. The same thing happens in the summer where the cool, conditioned air you pay for leaks out and creates a warm, uncomfortable environment. At Dr. Energy Saver Of Connecticut our wide range of insulation and air sealing services help keep air in, energy costs down, and improve the comfort of your home. As air leaks through your attic, passing through dozens of cracks and exposed openings in walls, floors, and ceilings, new, bad air seeps in through the basement and crawl spaces and is then lost to the outside again. This is called the "stack effect" and it causes your home to heat more air than it needs to while simultaneously losing the air it does heat at all. By air sealing your home, you ensure that all the good air stays in, saving you significant money. One of the major problems for houses in the winter time is ice damming. This is when snow melts off your roof and then freezes in the gutters and then, over time, the melted snow gets dammed up by the ice that has formed. This water then leaks through the roof into your house, making for a very inefficient heating and cooling system. 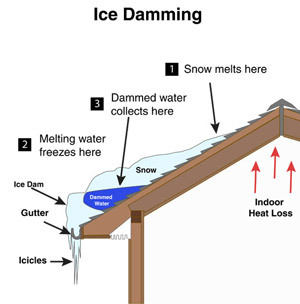 The way to prevent ice damming is to insulate and seal your attic as well as air ducts so that heat doesn't leak out of your attic through the roof in the first place. When your windows and doors aren't properly insulated, then all sorts of air can leak out through cracks, costing you needless amounts of money on energy bills. The windows and doors in your home are the only barrier to the outside, so why pay more in energy bills for them to not do their job? By carefully measuring your doors and windows, our expert technicians can install replacement windows and doors that are proven to seal in air and be an effective fit in your home. Dr. Energy Saver Of Connecticut employs only the best certified technicians because precision is key when it comes to insulating or air sealing your home. Let our team of friendly, knowledgeable staff help you find a solution that will work best for your home and help cut energy costs. Call us today for a free estimate! Open-cell spray foam was used in order to properly insulate this Stamford home's attic and exposed cantilever floor. Our team removed and disposed of the old insulation in order to insulate with open-cell spray foam for an open-cell attic conversion. My attic has not been touched in years. I need the old insulation and other debris removed and new insulation installed. My house seems to either be not cool enough in the summer and cold in the winter. Home is recently purchased and want to ensure heating and cooling costs are minimal. Most/all windows need replacement. We would like insulation blown into the walls. The house does not have a vapor barrier.